​​“A native of Scotland, Estate Agent Manager David McAulay was educated at Hamilton Academy before earning his sea legs with the Merchant Navy”. 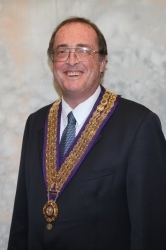 So reported the Ardrossan and Saltcoats Herald when he became Chairman of RT Area 47, South West Scotland. The paper goes on to report that David “had spent ten adventurous years as a deck officer, travelling the world mainly on passenger and cargo ships, and especially enjoying his time in Australia, New Zealand and South America”. Sadly, those days are gone. Back on land having seen the writing on the wall, David retrained and gained an HND in Business Studies at Glasgow College and then joined the Ayr branch of the Leicester Building Society. He continues himself, ’I was in charge of opening a new branch in Saltcoates, and in 1981 settled with my wife Morag at Seamill. I joined Ardrossan Round Table, 640, and held various offices including Chairman in 86/87’. I then held various offices in Area, culminating in Area Chairman in 91/92’. throughout Scotland, winning several trophies as a skip with Auchenames Curling Club in West Kilbride”. ‘In 2001 we sold our holiday property in Mallorca and bought an apartment in Javea. We continued to holiday here, then moved permanently in 2011’. At the 2014 AGM David was elected Chairman, supported by VC Peter Williamson, with Jim Thomas and Bob Oxley as Secretary and Treasurer respectively. The Treasurer reported that, together with the IPC, they had closed the Club Reserve Account due to an unauthorised withdrawal, (which had been rectified), and the application of un-notified charges, both actions taken by the bank. ​Following an abortive mission to find a Spanish bank that did not treat clubs such as ours as businesses, it was agreed that the Treasurer could keep the Reserve Account in his safe at home, providing that he signed a document to this effect to identify the Club’s asset being in his possession. Gordon Macnab’s offer to revitalise the website was gratefully accepted. problem with the words singing ‘Pack up your troubles’, but struggled with ‘Sister Susie’s sewing shirts for soldiers, such saucy soft short sleeved shirts my shy young sister sews’! Wow! We had a paella lunch in the beautiful setting of Restaurante Amanecer, Javea, and both Ladies and Charter Nights were held at La Cocina, Javea. In November, Chez Urs became a victim of a landlord rent hike, and Urs announced that he was to become the chef at Restaurante Montevideo, Benitachell, and hinted that the club could in future meet there. The club followed up on his suggestion, and moved there for it’s general meetings. The Cluster, hosted by Nerja, was well attended by Costa Blanca. The Christmas lunch was held at Pepe’s, Alcalali. The Newsletter reports that ‘Past Chairman Phil Fraser and wife Eliza are returning to Hong Kong for a family visit and plan short trips to Japan, Cambodia and Thailand, temporarily giving up their spacious villa accommodation in Javea for a 35 sq m two bedroom flat on Hong Kong Island. However, it was all worthwhile when they met their new grandson. Chairman David and wife Morag, en route to New Zealand, dropped in for a visit and a conducted tour of the sights’. This was the last Newsletter to be published, the club taking the decision to rely in future on the website to keep members informed. Invited by a friend to a Table Civic Night in 1977, where Alan Knott, the England and Kent wicketkeeper was speaking, Peter Williamson attended further meetings and subsequently joined Gravesend Round Table, 187. ’A child of the 1940s, (just), I started life in Carshalton, Surrey, then over the next 16 years, lived there, in Lanarkshire, back to Carshalton, then York and finally Kent, where I still am’. ‘At University I read Zoology and then a second degree in Business Studies. I had to take a test in London to get in to the second degree, so went back home for the weekend and stayed over for a family birthday. One night I was in a pub and a small blonde lady trod on my foot. I bought her a drink and believe it or not, she later became my wife. Ethna and I celebrate 45 years soon, have a son and daughter and two lovely grandchildren’. Recalling his days in Table, ‘they were happy times running things like go kart derbies, air shows, old folks Christmas meals, contact with the other Table -87 clubs and an attempt to twin with Gravelines in France. Although I managed to avoid most senior offices, I became Chairman in my penultimate year, then ejected in 1990. Joining Gravesend 41 Club was easy after a long time in Table, as many of the members had been in Table during my time. Although they are a sociable bunch and we still meet for the odd meal or golf day, the club itself has disassociated from the Round Table Family’. ​​National Conferences which have provided many memories. Also the Clusters and a unique tour to Israel in 2000 with Tony and Janet Ogden, culminating in the *chartering of clubs 3 and 4 of the National Association there’. (*see 1998/99 ‘Happy Holas and Sad Goodbyes’). ​​As usual, the social programme was circulated at the beginning of the year, embracing a variety of lunches or dinners at several restaurants around the area, such as Ca Maria and Montgo, Javea, with Christmas lunch at Pepe’s, Alcalali. The Cluster was hosted by Mallorca, and Ladies Night and Charter Night were both held at La Cocina, Javea. National President Terry Cooper and wife Lynn were hosted by Peter and Ethna, who held a St Patrick’s Day celebration the following day, much to the appreciation of Terry who exclaimed ‘that it is great to be just a house guest and not the main focus’. In a unique joint anniversary lunch at Restaurante Le Gourmand, Javea a total of 220 years of marriage were celebrated by Ted & Sue Homewood, 30 years; David & Morag McAulay and Andrew & Kathy Johnson, 40 years each; Jim & Chris Thomas, 50 years and Bob & June Grainger, 60 years. Congratulations! This is the nineteenth chapter on the history and development of the Costa Blanca 41 Club. Now that the Newsletters produced by Ted Homewood have ceased, it is being compiled from news articles, information provided by club members and pen portraits provided by the incoming Club Chairmen. The text is written by Bob Oxley, except that in italics which is directly quoted from articles and documents available at the time. The web posting and additional illustration images are provided by Gordon Macnab.